Southern Cone Travel: Zorro of Recoleta? When I was a young boy, more decades ago than I care to admit, one of our cultural icons was the TV character of Zorro. Long before I myself moved to California, the Disneyfied serial of an apparently supercilious Spanish nobleman who secretly fought for the underdog was simultaneously exciting and humorous (though some of the humor derived from Latino stereotypes, like the bumbling Sergeant García). Disguised in mask and cape, the figure of Don Diego de la Vega (played by Guy Williams) was a charismatic fighter for justice in colonial Alta California. My wife, growing up in Argentina, had a similar experience. Even before her own family had television, she would travel to visit her great-aunt in the Buenos Aires province town of Ituzaingó and, rising early in the morning, would spend hours glued to the tube there. Zorro was also one of her favorites, along with The Three Stooges, The Addams Family, and Bonanza (in which Williams briefly played a small role). As a series, Zorro ended in 1959, though it went through reruns and showed even later than that in Argentina. Williams went on to other roles, none of which I ever really noticed. Nevertheless, I was surprised to learn this week that, after retiring from acting, Williams moved to Buenos Aires in 1973. 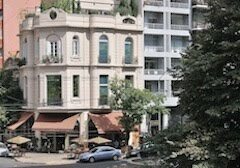 In 1973, Argentina was a chaotic country that did not appeal to many American expats, but Williams (given name, Armand Joseph Catalano) was the US-born son of Italian-Catalonian parents. 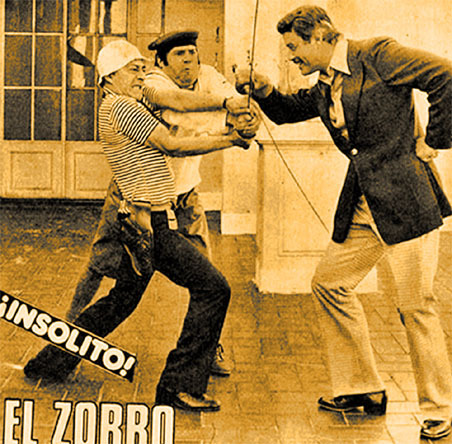 Certainly Zorro’s popularity helped and, perhaps, his ethnic background let him feel more at home at a time when Argentina’s political institutions were unraveling. Three years later, a military coup led to Argentina’s worst-ever dictatorship, which lasted until 1983. During his retirement, Williams occupied an apartment in the upscale barrio of Recoleta and, on occasion, performed on Argentine television (the photograph at top shows him fencing with slapstick comedian Alberto Olmedo in the 1970s). In May of 1989, though, he dropped out of sight and, shortly thereafter, a police search of his apartment found that he had died, aged 65, of a brain aneurysm. Interestingly, for an actor who played a Spanish nobleman, his ashes spent two years in the elite Cementerio de la Recoleta before being repatriated to California and scattered into the Pacific at Malibu. 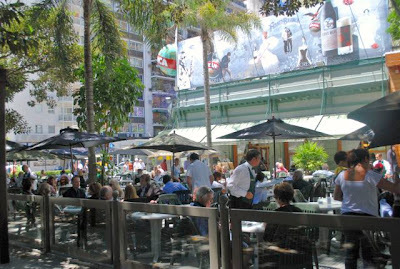 Williams continues to be a presence in Argentina, even though he no longer resides in the apartment at Ayacucho 1964, around the corner from the landmark Café La Biela (pictured above), his frequent hangout. There is, in fact, a website devoted to Guy Williams’ Argentina, which even includes the apartment’s floorplan. Today’s best known US expat may be Edward Snowden, the former intelligence contractor who recently revealed the National Security Agency’s surveillance (over)reach; after fleeing to Hong Kong and then Moscow, he has requested political asylum from the government of Ecuador. In a lengthy tongue-in-cheek analysis, Adrián Bono (a deputy editor at the Buenos Aires Herald) has used his new website The Bubble to suggest that Snowden should reconsider and ask for Argentine asylum, and offers five detailed reasons for his doing so. If so Snowden might, like Guy Williams, be advised to adopt a stage name.